It’s always very gratifying when other writers and prominent people agree to read your manuscript, and then offer glowing words to adorn the cover of your book. I tend to read these “blurbs” when I’m buying books, and I think others do too. So you can imagine how honoured I am to share the three blurbs that will be featured somewhere on the front or back covers of my new novel, No Relation, due to be published by McClelland & Stewart May 20, 2014. I tend to remember when I’ve been asked to take all of my clothes off and pose for a photographer. It hasn’t happened that often. So I vividly recall the day Amanda Leduc and Allegra Young contacted me many months ago. They asked if I’d consider posing naked for a calendar in support of PEN Canada. My first thought was that if they were hoping to raise money, there were probably better ways than publicly releasing a naked photo of me. Still, they persisted. Then I asked who else was going to be in the calendar sharing in this, um, exposure. I was heartened to hear the names of all the stellar writers who had already agreed. Vincent Lam, Dave Bidini, Yann Martel, Angie Abdou, Miranda Hill, Trevor Cole, just to name a few. This might be fun. Then I confirmed that there would be no group shot. I’m not sure I could have handled that. (Hell, I’m not sure I can handle what I’ve already agreed to handle!) So I said yes. How could I refuse? PEN is a great cause, an important cause. Besides, how could I look Angie Abdou or Vincent lam in the eye the next time we met at a festival knowing they agreed to doff their drawers but I hadn’t. My decision was also made easier because the photo shoot wouldn’t be for months. It seemed such a long way off back then. Well, here we are in early March, and the lens cap is about to come off followed quickly by my clothes. Man, the months whizzed by. Since January, I’ve been on a diet. DespiteÂ earning nicknames like ‘Ribs’ and ‘Bones’Â in my adolescence,Â for the last several years,Â I’ve been carrying around an extra 15 or so pounds. Okay, maybe 20. I’ve wanted to do something about it for years, but just never have. I can now report that the prospect of posing naked for a calendar was just the incentive I needed to start counting calories for the first time in my life. I’m not sure hearing a doctor say “You will have a heart attack in the next six months if you don’t lose 15 pounds” would have put me back on skim milk, but the Bare It For Books calendar certainly has. After seven weeks, I’m down nearly 12 pounds, and my triple chin is now a double. I’m hoping I’ll be a single, chin that is, by the time the photographer arrives. 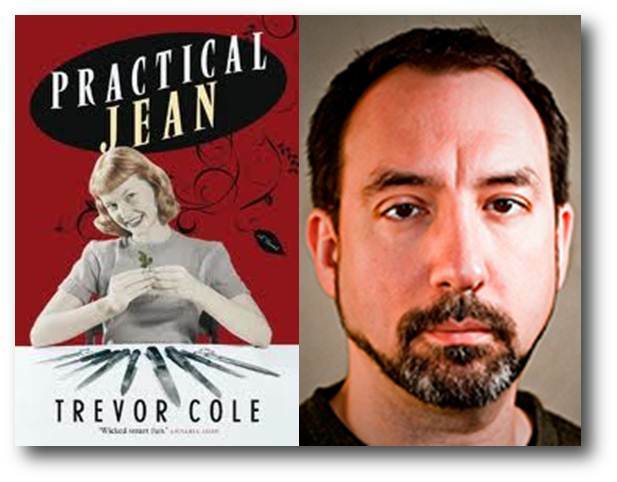 My friend Trevor Cole, Mr. February, lost 40 pounds(!) and posed with a strategically placed shovel, and I don’t mean resting over his shoulder. I’m not sure what I’ll use as my ‘prop of discretion.’ Perhaps a nearly-full-sized model of the space shuttle. Of all the weird, wacky, and wonderful experiences this writing odyssey has granted in the last five years, and there have been many, none will be quite as weird, wacky, and I hope, wonderful as the great naked calendar caper. I really hope thatÂ down in the Annapolis Valley,Â my beloved mother-in-law does not plan to hang the calendar on her refrigerator. Well, at least I’m Mr August. Most of Canada will be away on vacation that month and won’t be anywhere near a calendar. Probably wise. This past Sunday, I joined two other Leacock winners, Trevor Cole and Dan Needles, friends both, at Theatre Orangeville for an afternoon of laughs celebrating the legacy of Stephen Leacock. 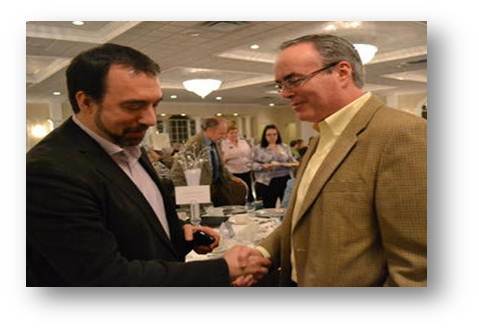 It was a wonderful afternoon before a soldout audience of nearly 300. At the book signing thereafter, a couple approached me and pulled out a photograph (below) of Norris “Cubby” Burke, age 93. He lives in the Eastern Townships of Quebec and served in the RCAF as a radio operator. He’s an avid follower of politics and public affairs. The couple with whom I spoke at the event are friends of Norris. Some time ago, they thought he’d enjoy my first novel, The Best Laid Plans and so they sent him a copy. 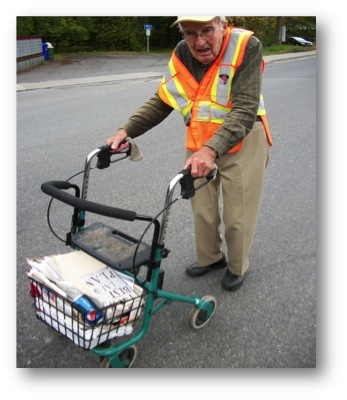 It was so gratifying to learn that he loved the book so much, he carries it with him on his daily walks around the beautiful Â village of Knowlton, where he lives. You can see it in the basket below. But that’s not the whole story, lovely as it is so far. 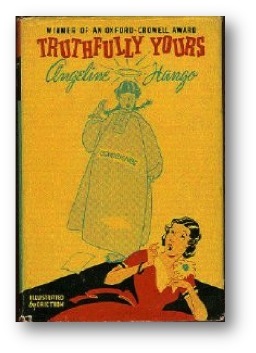 The kicker is that his late wife, Angeline Hango, won the third Leacock Medal for Humour back in 1949 for Truthfully Yours. I have a copy in my Leacock collection, and it is very funny. Apparently after this recognition, she never wrote again. It’s wonderful to have even a slight connection with the author of a Leacock Medal-winning book from more than 60 years ago. I have a pretty good idea how Trevor Cole was feeling yesterday afternoon. 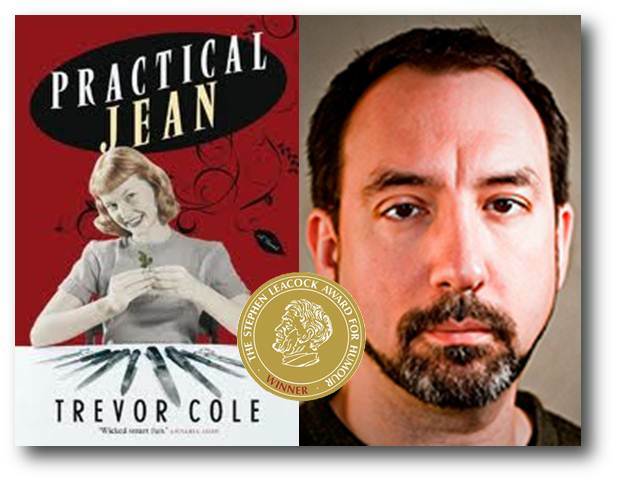 He’d just won the 2011 Stephen Leacock Medal for Humour in Orillia for his darkly hilarious novel, Practical Jean. (I still pinch myself every 20 minutes or so about my own win, and that was three years ago!) I’m thrilled for him and he deserves it. We met for the first time yesterday at the Leacock luncheon and I brought along my copy of Norman Bray, his first novel, which he kindly inscribed. I know what winning a Leacock Medal means to me, and what it’s done for my writing career, so I’m just delighted for Trevor. I’m looking forward to spending more time with him in the coming months (you know, to show him the Leacock ropes etc., etc.) and in particular, to appearing with him at the Leacock Summer Festival in July.